Are you still worrying about your network speed? Actually, there is no need to worry about this. The dramatic growth in bandwidth requirements has led to the increasing worldwide use of higher-performance optical products. Like 40G QSFP module, they support 40G network and allow data rates of 4×10 Gbit/s to be enjoyed by users in better-performance data transmission. This article introduces 40G QSFP+ module in details, which include 40G QSFP+ module and 40G QSFP+ cables. 40G QSFP+ module is a compact, hot-pluggable transceiver used for data communications applications. QSFP+ transceivers are designed to carry Serial Attached SCSI, 40G Ethernet, QDR (40G) and FDR (56G) Infiniband, and other communications standards. QSFP+ modules increase the port-density by 3x-4x compared to SFP+ modules. 40G QSFP module are high-density interfaces addressing deployment of high-performance computing in data center clouds. 40GBASE QSFP+ modules in this article are mainly introduced in two different flavors: 40G LR4 QSFP+ transceiver, and 40G SR4 QSFP+ transceiver. 40G LR4 Transceiver—40GBASE-LR4 (“long range”) is a port type for single-mode fiber and uses 1300nm lasers. 40G LR4 QSFP+ transceiver supports 40GBASE Ethernet rate. The 40 Gigabit Ethernet signal is carried over four wavelengths. Multiplexing and demultiplexing of the four wavelengths are managed within the device. 40G SR4 QSFP+ Transceiver—40GBASE-SR4 (“short range”) is a port type for multi-mode fiber and uses 850nm lasers. 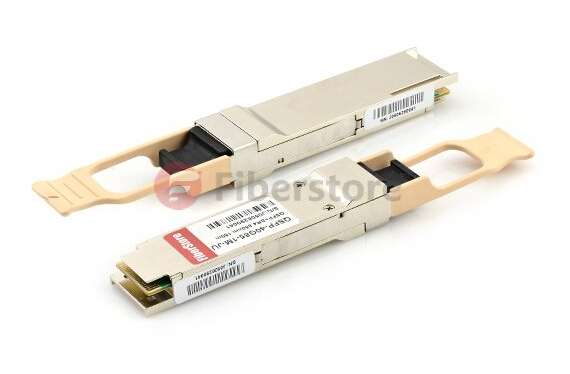 Take HP 720187-B21 transceiver for example, Fiberstore compatible HP 720187-B21 enables high-bandwidth 40G optical links and support link lengths of 100m and 150m respectively, on OM3 and OM4 multimode fibers at a wavelength of 850nm. Just like 10GbE optics, there are also direct attach cables(DAC) available for 40GbE modules when short distance (within the same rack) is needed. A variety of short-reach copper options are made available to enable 40GbE connection networks. Direct attach copper cables are designed in either active or passive versions. Both are widely used for 40G QSFP+ module solutions. For example, Juniper JNP-QSFP-DAC-7MA runs over active copper cable for very short distances. And Fiberstore compatible Juniper JNP-QSFP-DAC-7MA offers a very cost-effective way to establish a 40gigabit link between QSFP ports of Juniper switches within racks and across adjacent racks. There are also active optical cables available for 40GbE, like FCBG410QB1C10. This transceiver runs over active optical cable for 40GBASE Ethernet. 40GbE ports are capable of running in a 4x 10GbE mode, allowing for easy 10GbE/40GbE mixed media deployments. Fiberstore offers a broad selection of 40G QSFP modules for high-speed network connections, including the above-mentioned HP 720187-B21 and Juniper JNP-QSFP-DAC-7MA. For more information about 40G QSFP+ transceivers and 40G QSFP+ cables, you can visit Fiberstore. The 40G QSFP+ transceiver is a hot-swappable transceiver module which integrates 4 independent 10Gbit/s data lanes in each direction to provide 40Gbps aggregate bandwidth. 40GBASE QSFP+ transceiver provides a wide variety of high-density 40 Gigabit Ethernet connectivity options for data center and computing networks. 40G QSFP+ transceivers have various types like QSFP-40G-CSR4, QSFP-40G-PLR4, 40GBASE SR4 transceiver and so on. The following passages will mainly introduce the 40GBASE-SR4 QSFP+ transceiver. The 40GBASE SR4 QSFP+ transceiver modules support link lengths of 100m and 150m respectively on laser-optimized OM3 and OM4 multimode fibers. It primarily enables high-bandwidth 40G optical links over 12-fiber parallel fiber terminated with MPO/MTP multifiber connectors. And also, it can be used in a 4 x 10G mode for interoperability with 10GBASE-SR interfaces up to 100m and 150m on OM3 and OM4 fibers respectively. The worry-free 4 x 10G mode operation is enabled by the optimization of the transmit and receive optical characteristics of the QSFP-40G-SR4 to prevent receiver overload or unnecessary triggering of alarm thresholds on the 10GBASE-SR receiver, at the same time being fully interoperable with all standard 40GBASE-SR4 interfaces. The 4 x 10G connectivity is achieved by using an external 12-fiber parallel to 2-fiber duplex breakout cable, which connects the 40GBASE-SR4 module to four 10GBASE-SR optical interfaces. Below is a picture of 40GBASE-SR4 QSFP+ transceiver. From the above statement, it can be seen that 40GBASE-SR4 QSFP+ transceiver uses MPO (Multi-fiber Push-On) connector to support optical links. Why use MPO connectors rather than other connectors? Please keep reading the below passage and you will get an answer. With higher speed transmission mode, 40GbE drives the data center to run at a high-density and cost-effective style. Thus, parallel optics technology is considered to be a perfect solution for transmission due to its support of 10G, 40G and 100G transmission. The IEEE 802.3ba 40G Ethernet standard offers 40G transmission a direction by using laser-optimized OM3 and OM4 multimode fibers. Parallel optical channels with multi-fiber multimode optical fibers of the OM3 and OM4 are utilized for implementing 40G Ethernet. The small diameter of the optical fibers has no problems with the lines laying, but the ports must accommodate four or even ten times the number of connectors. So the large number of connectors cannot be covered with conventional individual connectors any more. Under this situation, 802.3ba standard incorporated the MPO multi-fiber connector for 40GBASE-SR4 because MPO connector provides a smooth transition to higher Ethernet speeds with minimum disruption and without wholesale replacement of existing cabling and connectivity components. In fact, MPO connectors have either 12-fiber or 24-fiber array. For 40GBASE-SR4 QSFP+ transceiver, a MPO connector with 12 fibers is used. 10G is sent along each channel/fiber strand in a send and receive direction and only 8 of the 12 fibers are required and provide 40G parallel transmission as shown in below figure. After looking through the above illustration, have you got a brief understanding of the 40GBASE-SR4 QSFP+ transceiver? Fiberstore, a leading and professional 40gbase sr4 qsfp+ manufacturers, offers high quality 40G qsfp+ transceiver including 40Gbase SR4 transceiver, 40GBASE-LR4 transceiver, Cisco QSFP-40G-SR4, etc. If you are looking for a 40G transceiver. Fiberstore would be a primary choice. For more information, please visit www.fs.com.